The Rev. 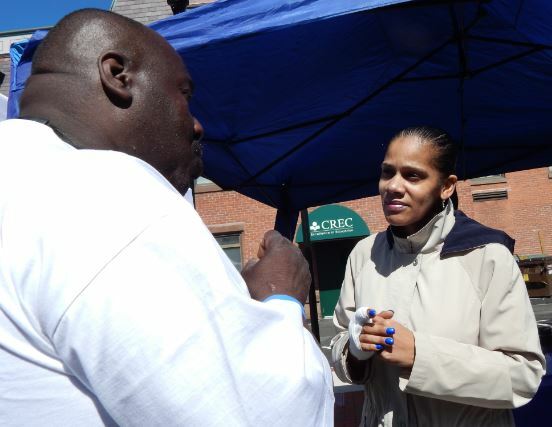 Shirle Moone Childs, left, and Rebecca Santiago talk about insurance and doctor visits at a Hartford health fair earlier this year. This is the first story in an occasional series on major issues shaping health care in the wake of the Affordable Care Act. 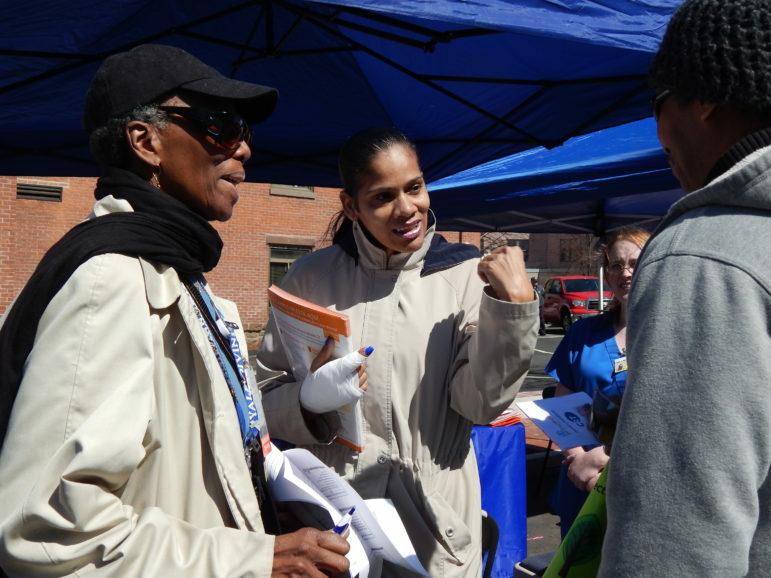 Rebecca Santiago clutched a stack of papers about Obamacare and chatted up strangers at the health fair, set up on a Hartford street within view of two homeless shelters. She wanted to know if they had health insurance and, perhaps more importantly, if they’d used it. One was Darin Zollarcoffer, 48. He had coverage, but no primary care doctor. So Santiago began the pitch to convince him to get care. A year ago, the conversation probably would have been different. Santiago – the community healthcare nurse navigator at the Curtis D. Robinson Center for Health Equity at St. Francis Hospital and Medical Center in Hartford – helped scores of Hartford residents sign up for coverage as part of the federal health law. But when she followed up with them, she found that having coverage hadn’t necessarily translated into getting medical care. So Santiago has revised her outreach efforts to include lessons on how to use insurance and mock interviews to help people feel comfortable asking doctors questions. She works to get the newly insured to visit primary care doctors; in some cases, that means calling around to find one who will take a Medicaid patient, or cajoling those who, like Zollarcoffer, aren’t eager to see a doctor. In some cases, she’s walked patients into a clinic at St. Francis to get them seen. Since the federal health law’s major provisions rolled out last year, much of the attention has been on getting people signed up for private insurance or Medicaid. But increasingly, the focus of those in health care, insurance and advocacy groups is turning to what comes next: making sure those who gained coverage use it to improve their health, and ensuring that the health care system is adapting to meet their needs – things that could be significantly more complicated than getting people signed up for coverage. Will the newly insured be able to find doctors to treat them? Will people know how to use their insurance? Will people begin using more preventive care, rather than waiting until they get sick and need costlier services? Will the health care system change in ways that accommodate those goals, evolving from a system that cares for the sick to one primarily focused on – and financially rewarding – keeping people healthy? And will doing so enable it to rein in costs that are increasingly eating into government, business and family budgets? Rebecca Santiago chatted with Darin Zollarcoffer at a health care earlier this year. Her goal: Help him get health care. “Everybody’s trying to address this issue,” she said. 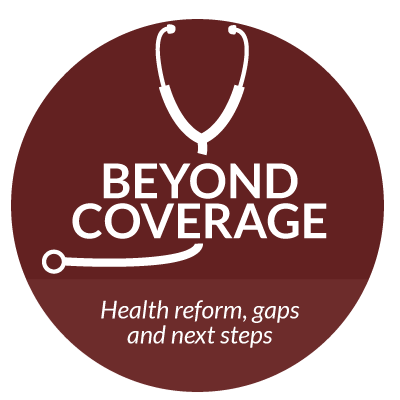 Officials at Access Health CT, the state’s health insurance exchange, are also trying to determine how to help people better understand how to use their coverage and navigate the health care system. A recent survey of customers with private insurance found that 28 percent did not have a primary care physician and 36 percent had not used their insurance plans. CEO Jim Wadleigh called the latter statistic startling. Santiago is among those trying to make sure those with coverage can actually use it. In addition to her job at St. Francis, she is president of the Hartford Chapter of the National Association of Hispanic Nurses, which has a major initiative aimed at educating people about the health law and helping people get covered. She gives presentations, often at churches and faith-based organizations, and hears people’s stories. Taken together, they help to illustrate the varied and sometimes complex challenges in ensuring people get the care they need. Some people with Medicaid have struggled to find a doctor who will take them, Santiago said, while some people with private insurance worry about having to pay thousands of dollars toward their care before their high-deductible plans begin chipping in. Often, people are surprised to learn that some preventive services are covered at no charge, even if their plans have large deductibles. She’s met some insured people who were planning to go to a health fair to get free screenings because they feared they would have to pay at a doctor’s office. Some don’t have any insurance – often because they couldn’t afford their premiums and dropped out, or are not in the country legally and are ineligible for subsidized coverage or Medicaid. Santiago refers them for help – either to see if the qualify for financial assistance at St. Francis, free screenings and care at the Curtis D. Robinson Center, or the Malta House of Care, a free clinic that provides care aboard a Winnebago. She doesn’t want people to get out of a conversation thinking they don’t qualify for health care. “There’s always an option for them,” she said. There are other, less tangible reasons people avoid seeking care – things Santiago tried to address during the health fair. A man with a family history of prostate cancer started walking away when Santiago mentioned getting screened for the disease. 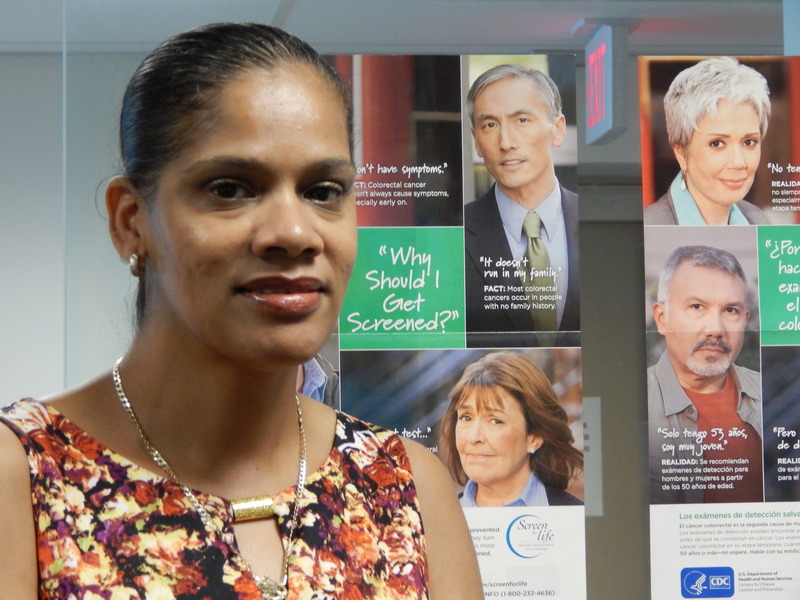 Rebecca Santiago, community healthcare nurse navigator, at the Curtis D. Robinson Center for Health Equity at St. Francis Hospital and Medical Center in Hartford. Santiago spoke to another man in Spanish and learned that he has diabetes, hypertension and a mental health disorder – and that he couldn’t find a primary care physician. To Santiago, it was a red flag: He’s the sort of patient who, without a regular source of care, would likely show up in the emergency room. “He’s a ticking time bomb,” she said. She planned to talk to the medical director at one of the St. Francis clinics about him. To make the pitch for health care, she often started with other topics, deftly turning the discussion back to care when she found an opening. Much of Santiago’s conversation with Zollarcoffer, the 48-year-old without a doctor, centered on baseball rivalries. He’s from Boston. She’s from the Bronx. They teased each other about championships. He mentioned his fear of doctors and hospitals. But that wasn’t the only thing keeping him from getting care. Zollarcoffer had been living at a shelter for about two months. He has diabetes and needed a primary care doctor, but things got in the way, he explained in an interview. One was the restriction on when he could leave the shelter for the first month he was there, he said, which made it difficult to get to a community health center to see a doctor. And he struggled with depression at times, and knew he had to get things like doctors’ appointments set up when he was feeling up to it. “There are some days when I just can’t go anywhere,” he said. Zollarcoffer’s father died of prostate cancer. Santiago explained that he was at higher risk for the disease because he’s African-American. Then she suggested he come visit her at the Curtis D. Robinson Center later that day. “I will draw your blood today for free,” she said. Then she upped the offer: I’ll look at your test results and tell you if there’s any reason for concern, she told him. I’ll get you in touch with a urologist. All the decisions about what to do are up to you. They high-fived before he walked away.